First, I want to alert everyone that at 1pm Eastern on Thursday, I'll be making a post as part of a Blog Hop here. We've done this before. If you view the post from my blog, you'll have access to dozens of other blogs, all writing on the topic of resurrection and rebirth for Ostara or Easter. Next, I've been doing a lot of thinking since Monday's post about the stories we tell ourselves. Unfortunately, I don't have time to write them up because of work. So here's a classic post from 1/7/12 that expands on the conversation. 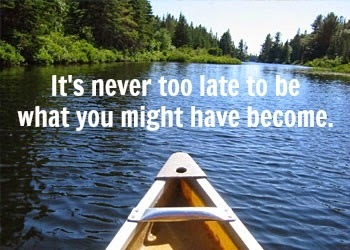 The quote on today's image is from George Eliot—"It's never too late to be what you might have become." And who better than Mary Anne Evans (aka George Eliot) to deliver that message? She wrote some of the Victorian age's most popular novels—Mill on the Floss, Silas Marner and Middlemarch—under a male name to ensure her work was taken seriously...to ensure that she would be what she might have become had she not been subject to stereotype about the kind of literature a woman could create. I was lucky to grow up with a mother with a successful "man's" career. Her generation was really the first to take the risks of entering a man's world and it forged new possibilities for women. She never allowed the fact that she was a woman to limit her career, but she *was* limited by the fact that she was the mother of six kids and the wife of a high-ranking officer...a wife that's expected to entertain and lead "the ladies". Put it all together, though, and she totally worked her overall potential...successful career, marriage and family. That's rarely truly achieved today, much less in the '60s and '70s. So I grew up believing there really were no limitations based on the fact that I was a woman. But in other areas of my life, my parents and my environment offered clues that there were some dreams that just weren't in the cards for me. And just as I bought into knowing that being a woman wouldn't limit me, I unfortunately bought into believing that there were other aspects of who I was that would. I think if you poke around enough, you'll find this is the story of every person reading this blog. Maybe you were too short to be taken seriously. Too pretty to be appreciated for your brains. Too opinionated to play the role of a mediator. Too independent to work for the government. Too poor to get out of the 'hood. Or may just not "good enough" at something to be a success at it. I doubt any parent or teacher or sibling or other influential person meant to limit you in that way. But before you got a chance to really even explore your options for yourself, someone or some situation came around to tell you who you were and who you weren't. What you were suited for and what you weren't. They may not have even said it to your face, but you knew it was there. Concern over your grades. Worries about how you never had any friends. Fears about you being too wild. And this became part of your story for however long. Childhood psychology and modern thought indicate that the things that happen in your life prior to the age of 8 or 10 pretty much shape everything thereafter. So, for example, the loss of a parent at four might have far more wide-reaching effects on who you are than the loss of a parent at the age 13. Both are tragic and pack impact, but your ability to process the impact in healthier ways grows as you do. So these things that happen during those impressionable years have a tendency to stick. And, having lived with those beliefs for decades, we may not ever question them. They become part of our truth...part of our story. We end up believing them as if we'd tried and failed and it were all true. But we really need to take stock at some point and question them, because chances are those beliefs and limitations are a reflection of someone else's fears about us than actual facts. For every limitation out there, there's someone out there, like George Eliot, who bucked it. Certainly Oprah heard many times that her weight would keep her from succeeding...or her poor upbringing would keep her from being accepted by a certain part of society. She even tells a story about how her grandmother taught her to scrub floors in preparation for her life as a black woman in American society. I'm sure Oprah's not devoid of false limitations, but she completely defied the most obvious ones. Because she got that they weren't about her. They were about everyone else's fears and limitations. So think about the things that are holding you back, whether they're physical, psychological, social, societal, financial or whatever. And really try to trace that belief back to its origins. Is it true? If it was true then, is it true today? And think also about "what you might have been" if it weren't something deemed silly or impractical or impossible at one time in your life. You may find that false beliefs based on someone else's life view could be holding you back from what you might have been. And, like George/Mary Anne says, it's never too late to right that wrong.